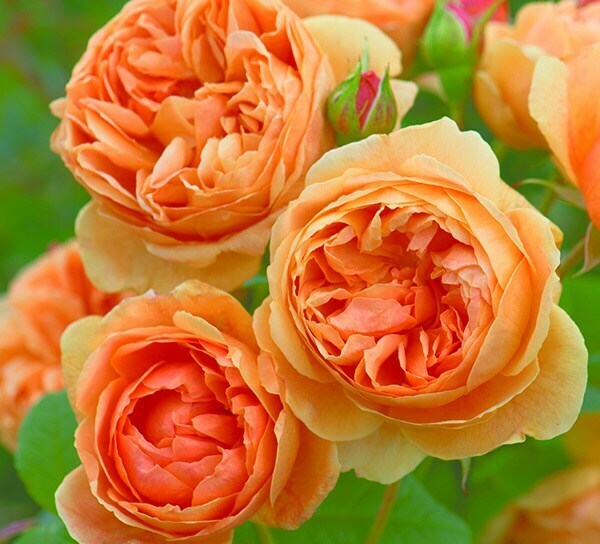 A recent introduction, this beautiful David Austin rose has pink-flushed, apricot coloured buds, which open to large, fully double, rich gold blooms. Their scent is delicious, each one slightly unique, but with hints of honey and almonds. The stems are almost thornless and relatively vigorous, clothed in lush green leaves. A wonderful addition to the rose garden. plant was ordered as a gift for a friend. when it arrived in may it was a bit dry but as soon my friend planted in the garden it was well rooted and soon began to blossom producing peach styled roses surrounded with intricate folded petals. it grew quite quickly and healthy. ive read in places that it is possible to consume most rose petals varieties. when eaten the petals tasted fruity and gave off a pleasant light scent. ! would ideally like to dry the petals for salads. Yes, i can recommend this rose variety to others.